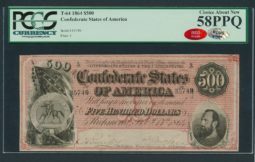 Here at www.highdenomination.com we specialize in $500 Confederate notes, type T-64, as it runs in theme with other high denomination notes. 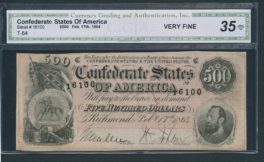 The 1864 $500 Confederate note is arguably the most popular Confederate currency issue. 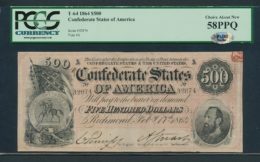 The note features vignette of General Stonewall Jackson, one of the most beloved Southern commanders of the Civil War. The further depiction of the American Flag lends the note being nick named Stars and Bars note.